The McAfee Security Connected framework helps you meet industry and government regulations, and lower the cost of continuous compliance for your data center. Optimized for ease of management with automation and enforcement, McAfee solutions improve visibility, limit exposure, and ensure continuous compliance, saving you time, effort, and expense. McAfee compliance solutions help you meet the latest industry and government security regulations — including HIPAA, SOX, FACTA, and PCI DSS — quickly and easily. McAfee Data Center Security Suite for Databases is a bundle that includes McAfee Database Activity Monitoring and McAfee Vulnerability Manager for Databases. Our comprehensive range of industry-leading tools integrates overlapping requirements, automates time-consuming tasks, and speeds proof of compliance to save you time, trouble, and valuable resources. It’s a broadly accepted principle that the database is home to some of the most sensitive and valuable information with the enterprise, placing a premium on robust security. Poorly protected databases are a cybercriminal’s dream come true. They contain your company’s most valuable, easily exploitable data—all nicely packaged in convenient locations. It’s understandable why databases are the leading target of sophisticated cyberattacks by hackers and are increasingly exploited by privileged users inside of organizations. However, there’s plenty you can do to protect your company’s databases—and reputation. What’s more, with McAfee® Database Security, achieving protection and compliance is easier than you might think. According to a recent Verizon Data Breach Investigations Report, more than 92 percent of records breached involve a database. Annual research by the Computer Emergency Response Team (CERT) indicates that up to half of those breaches are caused by internal users. Why is this happening? Put simply, most companies have insufficient database protection. Three out of four organizations rely solely on the native database security features provided by their database vendor—features that can be easily bypassed by a database administrator or other privileged users. Network-sniffing security strategies provide only a partial view of threats and are costly to deploy, while log-based host security only offers after-the-fact forensics that do nothing to prevent attacks. Until now, corporate IT security and database teams have had to choose between two less-than-desirable options: either sacrifice database performance for only marginally better protection or run lean and risk noncompliance to avoid database downtime. At McAfee, we believe both of these choices are unacceptable. That’s why we offer McAfee Database Security. Work from a single McAfee ePolicy Orchestrator (McAfee ePO) management platform to gain visibility across IT controls and PCI requirements — and reduce the headaches, expense, and delays associated with separate products. Avoid time-consuming ad hoc processes and eliminate errors with McAfee’s automated scanning, audits, remediation, enforcement, and reporting. Protect vital cardholder data and comply with PCI DSS requirements, the suite’s McAfee Database Activity Monitoring function protects access to sensitive payment card data and provides real-time database monitoring. McAfee Database Security offers real-time protection for business-critical databases from all types of threats: external, internal, and even intra-database exploits. This software-based solution provides robust security and continuous compliance without requiring architecture changes, costly hardware, or downtime. In other words, it’s an efficient, affordable way to protect databases while preserving database performance and helping to ensure continuous business operations. Gain precise security posture insight through database discovery and comprehensive vulnerability assessment. McAfee Vulnerability Manager for Databases allows you to perform a fully automated discovery of all existing databases within your environment, along with a thorough scan to identify which of those contain sensitive data such as payment card information, Social Security numbers, phone numbers, and more. McAfee Vulnerability Manager for Databases also gives you detailed, actionable information to help you prioritize and remediate thoe security gaps, saving your organization the considerable expense of outside security consultants while better preparing you for compliance audits. Full integration with McAfee ePO software means database security is no longer confined to its own administration silo. Now, a single-pane-of-glass console lets you easily bring databases into a unified security management program. McAfee has a dedicated database security research team that has developed more than 4,200 individual vulnerability tests. This team continually identifies and prioritizes specific database security risks and creates additional vulnerability tests to address the changing threat landscape. Protect business-critical databases in real time across all threat vectors—without downtime. McAfee Database Activity Monitoring provides real-time visibility into all database activity, including local privileged user access and sophisticated attacks from within the database. It protects your databases with a set of preconfigured defenses, and helps you build a custom security policy for your environment—making it easier to demonstrate compliance to auditors and improve critical asset data protection. In addition, this powerful monitoring solution prevents intrusion by terminating sessions that violate security policy, while providing a reliable audit trail of all database user activity. McAfee Database Activity Monitoring is an affordable, software-only solution that can be deployed in less than one hour without the need for special hardware or additional servers. It scales cost effectively to address your growing database monitoring needs, and the memory-based sensor implementation is ideal for both virtualized and cloud environments. Update the security posture of our databases in real time, without downtime. Testing and deploying vendor-issued patches is an ongoing, arduous process that results in a time window of system vulnerabilities that exist until IT staff can bring business-critical databases off-line and deploy patches. This vulnerability window is well understood by IT staff and hackers alike. McAfee Virtual Patching for Databases shields databases from the risk presented by unpatched vulnerabilities by detecting and preventing attempted attacks and intrusions in real time without requiring database downtime or application testing. This virtual patching solution also helps you continue to protect databases running old DBMS versions that are no longer supported by the vendor, adding to the useful life of legacy databases and saving your organization time and money. Enjoy end-to-end security visibility and management without blind spots. McAfee ePO software is the industry’s most advanced security management console. It gives you end-to-end visibility into database security, enterprise security, compliance postures, and compliance reporting. This award-winning console integrates with other McAfee security and risk management products and those of McAfee Security Innovation Alliance Partners. Keep Your Databases Safe and Available. Learn More Today. At McAfee, we realize your databases store your most critical business assets. They must be available around the clock to power your business. And, just as your databases don’t take a day off, neither do we. It’s why we say, “Safe never sleeps.” Rest assured, our team of database security experts is relentlessly focused on keeping your sensitive information safe and available, while helping your company ensure compliance with internal policies and industry regulations. McAfee, a wholly owned subsidiary of Intel Corporation (NASDAQ:INTC), is the world’s largest dedicated security technology company. Our next-generation endpoint security solutions provide security across all of your devices, the data that runs through them, and applications that run on them. These comprehensive and tailored solutions reduce complexity to achieve multilayer endpoint defense—without impacting productivity. It’s the perfect blend of traditional smart malware scanning, dynamic whitelisting, behavioral zero-day intrusion prevention, unified management, and integrated threat intelligence. 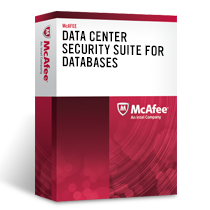 Download the McAfee Data Center Security Suite Databases Datasheet (PDF).